What does Mobile Notary Service mean? Many members of the San Diego County who call requesting Notary Public service do not understand the option to use a mobile Notary service. Mobile means that the mobile Notary service will travel to you, at whatever location you indicate. 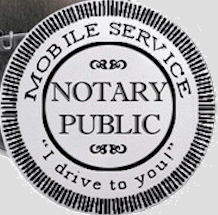 Mobile Notary service also means that there is usually not an office to visit. Like other businesses that offer mobile services, this service often comes with a travel fee. The travel fee is both for the convenience as well as the expenses related to the mobile notary public traveling to you. Mobile Notary service is most often utilized when a signing is occurring in an office setting where it is not easy to travel during work hours to wait in line at a post office. Mobile notary service is also used when the signer is hospitalized, not able to travel, or simply very busy and would prefer the convenience of having a Notary Public travel to them. Sometimes it is used because the signing will take a long time, or has extensive about of signers and signatures and traveling to a post office is just not an option. If you are in need of mobile notary service in San Diego County, search for a mobile notary public and inquire about price at your specified location. We offer flat rate pricing based on a range of miles traveled, and do not charge extra based on the type of location unless it is a San Diego jail.